Oozing energy, originality and a certain charming incongruity, Australian Bruce Mathiske delivered a show that would keep any music fan captivated. The Linenhall Arts Centre, Castlebar: the kind of venue some might call intimate, others, well, small. Needless to say it has never attracted the rich and famous, those with the big names and even bigger tour entourages, but who needs fame when you can have talent? There isn't a seat to spare as the crowd pours in 2 minutes before the show starts (unusually early for Mayo concert-goers). Then the man who travelled all the way Up Over just to put on a show, the virtuosic Australian solo guitarist Bruce Mathiske, strides onstage wearing a casual suit and looking like he'd be more at home behind the counter of a small town bookstore. Suddenly his bookstore persona vanishes and he not so much oozes charisma as pulses it in the rhythm of his playing as he plugs in his guitar. Tall, striking and funny, he immediately puts the motley crowd at ease and provokes an enthusiasm not usually seen in an icily modern Arts Centre with his solo guitar version of Eleanor Rigby. There was a man who was having fun. Occasionally joined by a bassist whose very stance made him look like he'd rather be standing at the door checking ID, and a percussionist who looked like he'd rather be at home in bed, he launched right into the show, following the Beatles classic with his own rendition of the theme from the film Black Orpheus and then straight into Bach's Toccata, all played with gusto and a style rarely encountered. 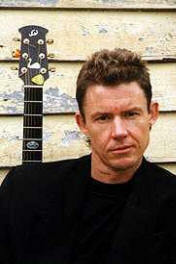 Bruce Mathiske is a regular face on the Irish music scene. He has toured our fair little isle a dozen times over the last ten years, and all the shows of this tour are being recorded for a new live album to add to his present four. Listeners were treated to songs from all four albums and some previously unrecorded originals and original covers. Combining elements of swing, Spanish, rock, Cuban, blues, classical, gypsy, pop, jazz, easy listening, folk and more with style, he is in his own words "uninhibited by direction" and surpasses expectations at every turn. With newly-turned-Cuban-style Caravan Bruce gave us a demonstration of how he writes for solo guitar - combining the work of three. The Australian takes on the roles of bass, rhythm and lead on his one acoustic guitar, with unnatural-looking hand contortions and fingers that move faster than a hummingbird on speed. Every guitarist in the place turned green with envy? Unfortunately the show is now coming to an end, but finally the mystery is solved. What the *^%* is that weird-looking pipe wrapped and sellotaped around a mike in the background? Some kind of torture implement, or the invention of a mad snake-obsessed sound engineer? But it's nothing so mundane, only his home made travel electric didgeridoo. And let me tell you, a man who can play the guitar and the didgeridoo at the same time can only command the greatest respect. Catch him live if he's within 100 miles of your town. And guitarists, if you do see him live, grab some tab at same for something, shall we say, a little challenging? Whatever your type of music there's something for you in this show. Genres? Bah, who needs 'em? It's all Mathiske in the end.